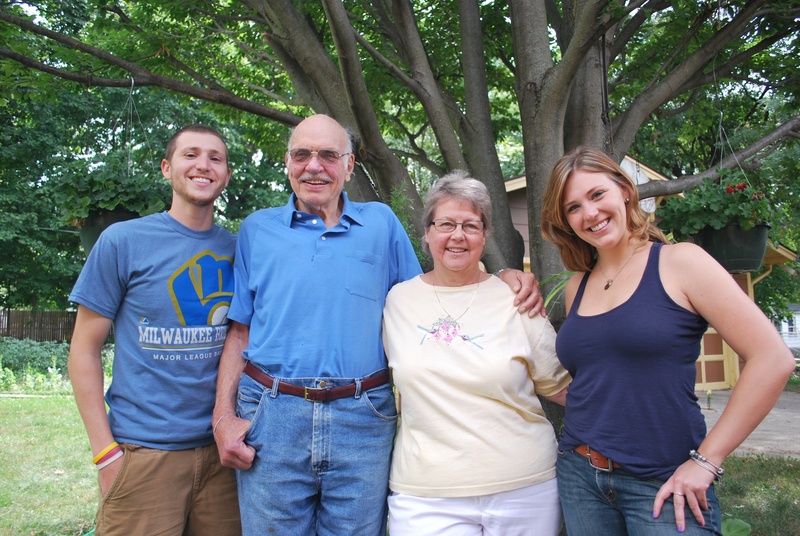 On Wednesday I drove my sister to Delavan where we visited with my Grandpa and Grandma. Eliza was catching a 5:30 PM train from Harvard down to Chicago and Wally and Rosalie were going to take her to the train stop. I visited for about an hour and left their house at 11:10. Before I left we used a a picnic table, an upside down bucket and a hose accessory to get a picture of the four of us. I was parked in the Money 2 lot at 12:10 and walked towards the home plate entrance. I heard a band playing and when I got closer I saw that the band consisted of Marines in uniform. It was The Marine Corps Band New Orleans, and they were good. I initially took a picture but then remembered I could record video on my iPhone (I’m an idiot). They said “When the Saints Go Marching In” would be their last song and I began recording shortly after they started. The trumpet player towards the end is really good. I went inside after they were done and headed to section 106 to get game photo number 110. 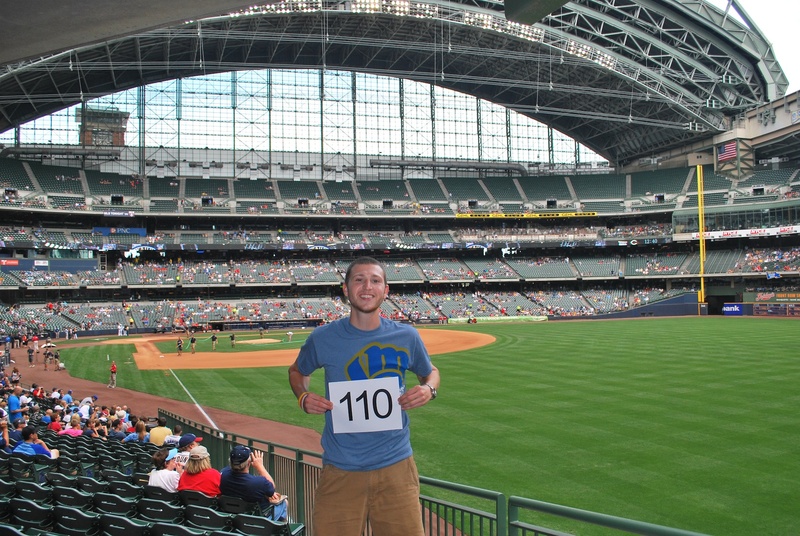 I had a nearby Brewers fan take the photo for me. I didn’t get a name but if you’re reading; Thank You! I met my twitter follower up in my seat and we talked baseball as we waited for the game to start. 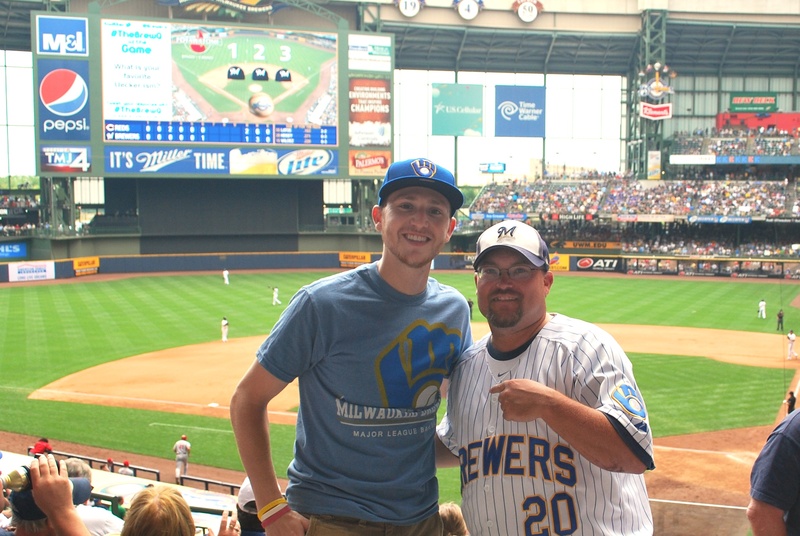 Scott W. joined me for the game on Wednesday and he went above and beyond by donating $50 when all I ask for is $40. Thank you Scott! 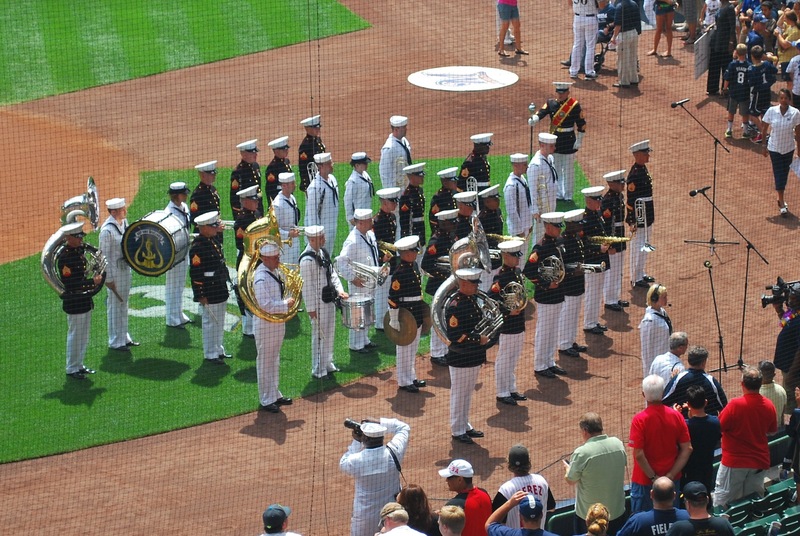 I found out that the Marine Corps Band New Orleans was performing the National Anthem with the Navy Band Great Lakes and it was nice. I always like it when a band plays the national anthem. There was a singer as well but there’s something about a band playing it that takes you back (to what, I don’t know). 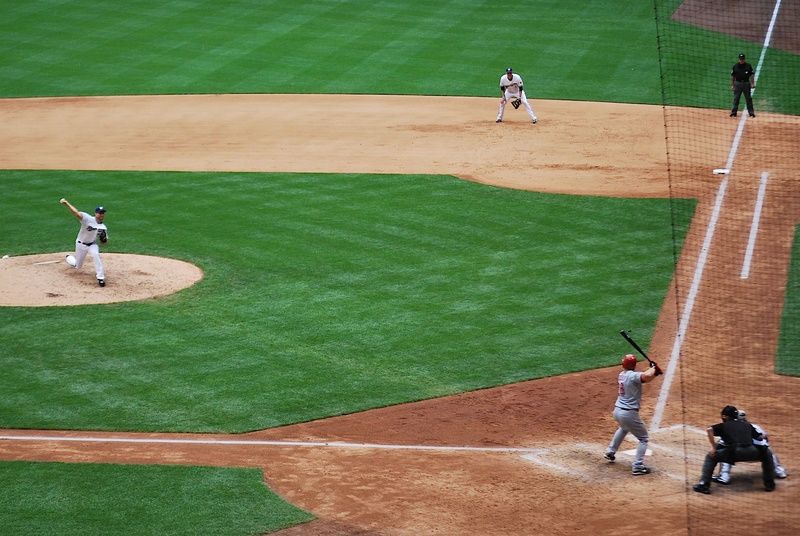 The game started and Randy Wolf delivered the opening pitch to Zack Cozart. 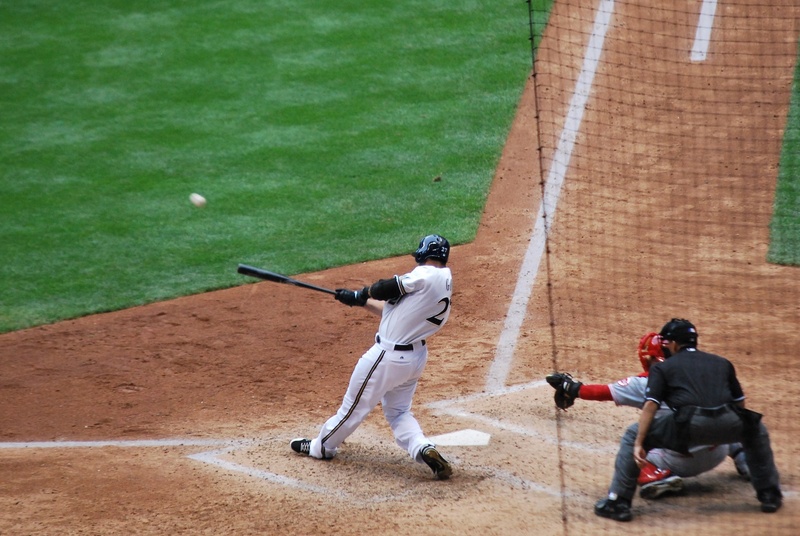 The game was scoreless going into the top of the third when the Reds took a 2-0 lead on a home run from Dioner Navarro. 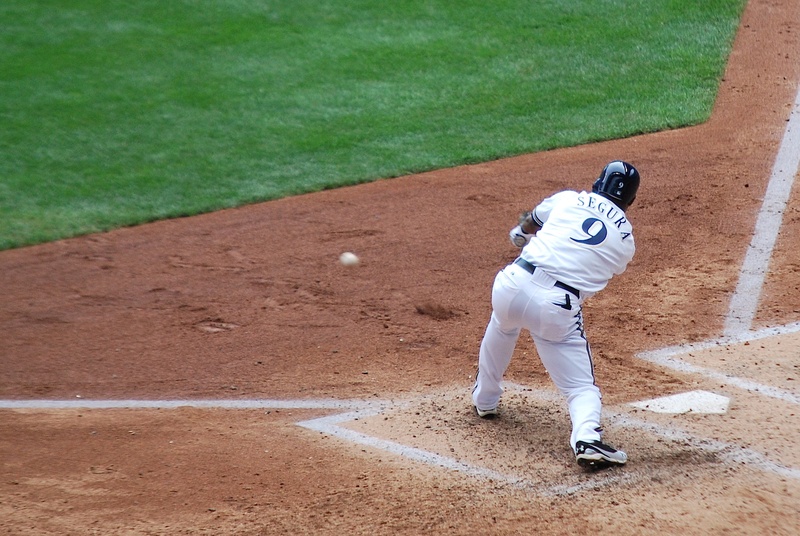 In the bottom of the 5th inning Jean Segura recorded his first hit in the major leagues, hopefully the first of many. Nice work, kid!!! I feel like I can say kid because I’m three years older than him, eeeeeesh. Makes me feel old. After saying that though I remember that I can average the age of my body with the age of my immune system, and since my immune system is that of a 34-month-old; I am just over 14 years of age. 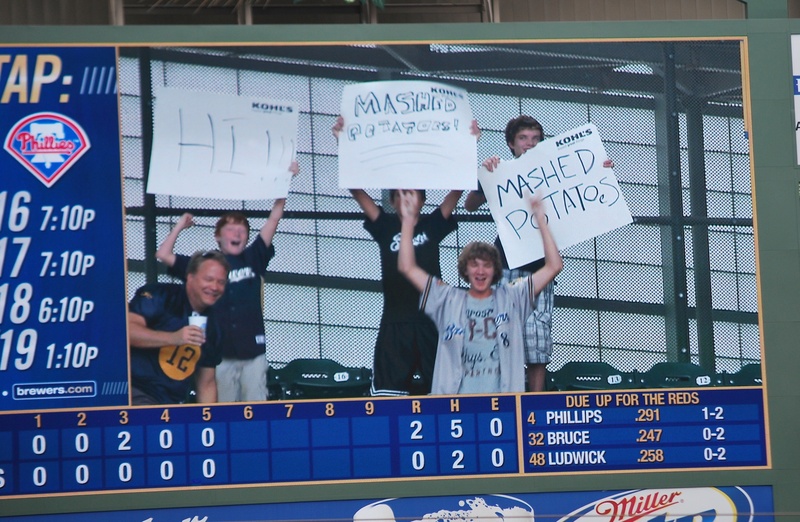 I like mashed potatoes as much as the next guy but putting that on your sign? I like that the sign on the right was misspelled originally and then corrected with a small “e”: good stuff. 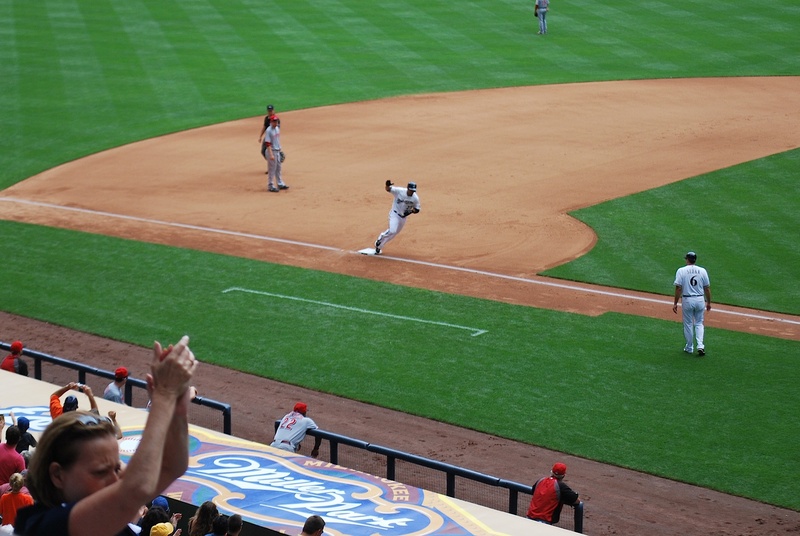 In the bottom of the 6th the Brewers cut the lead to 2-1 when Go-Go sent one just over the centerfield wall. Here he is rounding third. Between the 6th and 7th I had the lady behind us take a picture of me and Scott. Scott’s a cool guy, is a 20-game pack holder in the loge infield (same seating area as myself), and we shared a lot of opinions regarding baseball related topics. In the bottom of the 8th inning Segura and Lucroy flew out and the Brewers were down to their final four outs. 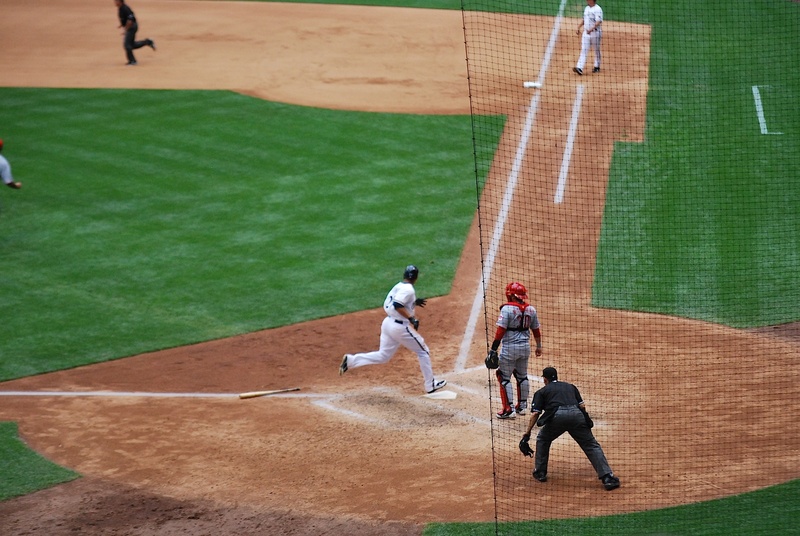 With two outs Aoki singled on a swinging bunt down the third base line. He stole second and moved to third on the throw down to second base. Gomez was at the dish and he sent one to left that just made it over the shortstop’s outstretched glove for a game-tying RBI single. Braun took off for second base because the left fielder had dove but it was a very close play at second. 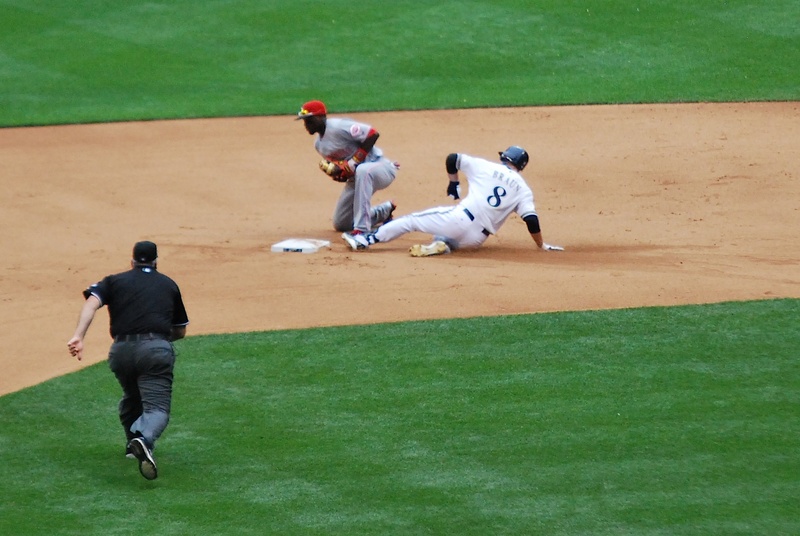 The home plate umpire was actually looking at Gomez touching home plate as well as Braun sliding into second. If Braun was tagged out before Gomez touched home the run wouldn’t have counted, since the third out would have been recorded before the run scored. Jim Henderson, who had saved Tuesday night’s game, was back on the mound Wednesday with another opportunity. 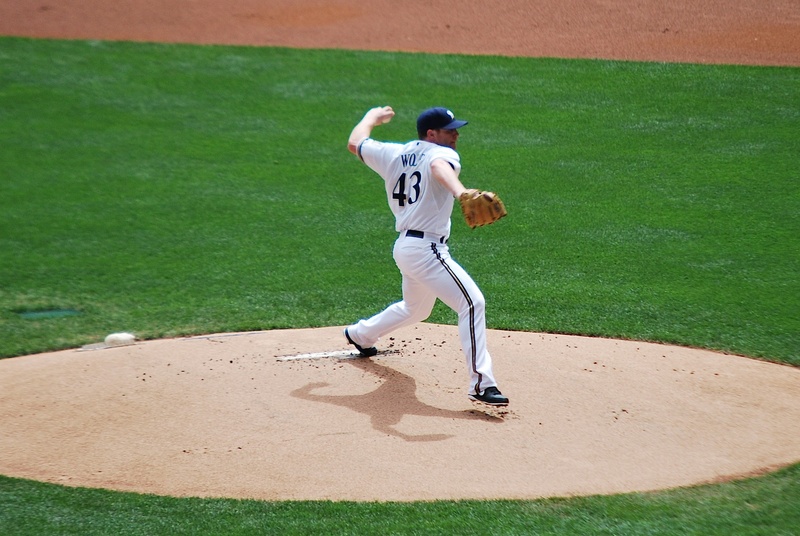 He struck out the first two batters he faced but then walked Drew Stubbs. Stubbs is fast and he stole second base, putting the tying run in scoring position. Henderson delivered a 86 MPH slider to Chris Heisey for his 1-2 offering. Heisey got under it and lifted a fly ball to right field. 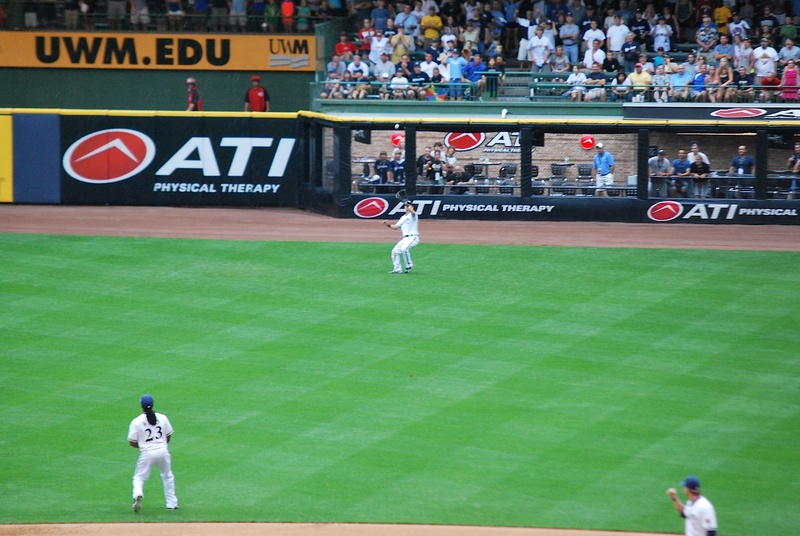 The ball is above Aoki’s glove and just below the yellow line that runs along the top of the wall. I like that Corey Hart (lower right) already has his fist in the air. Brewers win! Brewers win! 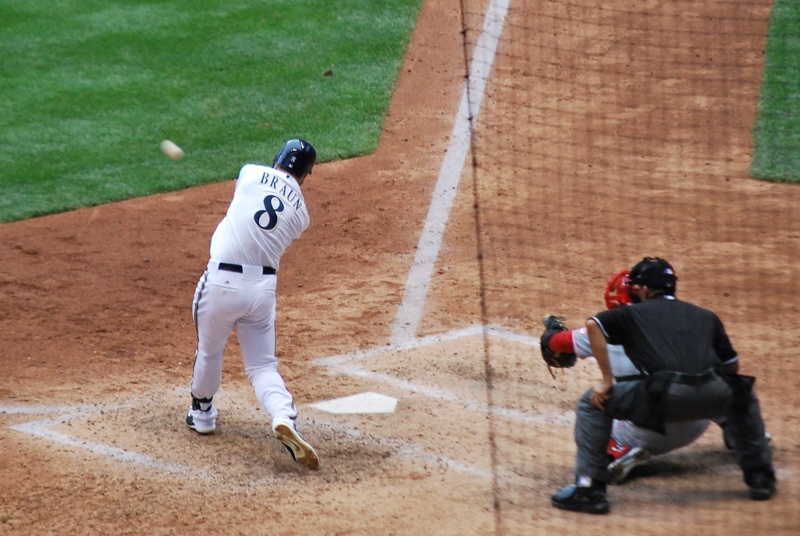 Final Score: Brewers 3 – Reds 2. The win completed the sweep for the Crew. Apparently all they needed was some home cooking! 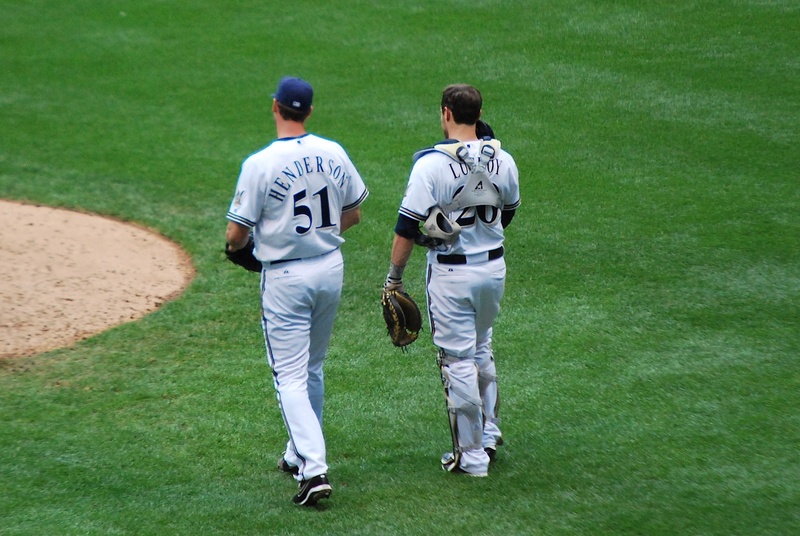 Henderson and Lucroy embraced and walked back towards the mound for the celebratory post-game high-five line. It’s midnight on Thursday morning as I write this and I need to get some sleep. I’ve got an oil change at 9:15 in the morning, then it’s off to Milwaukee to catch my 1:40 PM flight to Tampa, where I connect. A 6:15 PM EST flight will take me to Houston and I should be there by 7:30 central time. The Brewers haven’t won an away game since the last time they were in Houston; July 8th. I’m keeping my fingers crossed that the Crew can snap their current 9-game road losing streak. I won’t be posting about the off day because nothing interesting should be happening. The post for Friday’s game will be up Saturday morning sometime, depending on how ambitious I am.